The road to St. Louis - How we got here. General Conference 2019 is unique in the history of The United Methodist Church. It is a special called meeting of the global church that typically only meets every 4 years, the next scheduled meeting in 2020. However at the 2016 General Conference decades of conflict over how to address issues surrounding LBGTQ persons finally came to a head. This timeline helps explain how this special 2019 meeting evolved and what is at stake. At the General Conference in Portland, Oregon, delegates voted not to take up any legislation related to homosexuality and proposed the historic and extraordinary measure of asking the Council of Bishops to lead the church forward in finding a solution to the issues surrounding LBGTQ issues. 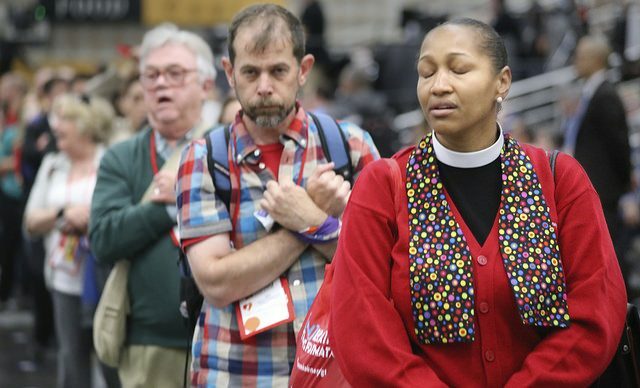 The Council of Bishops’ then call for the General Conference to “pause for prayer” and form a commission to explore options that help maintain and strengthen the unity of the church. Delegates approve that measure by a vote of 428 to 405. The executive committee meets to identify the mission, vision and scope of the work and select three moderators. Bishops nominated and selected 32 members to serve on the Commission For A Way Forward, focusing on a diverse body that represents our global church. The Council of Bishops announced a special session of General Conference to be held in St. Louis, Missouri on Feb. 23-26, 2019. The purpose of this Special Session of the General Conference is limited to receiving and acting upon a report from the Commission on a Way Forward based upon the recommendations of the Council of Bishops. The final report of the Commission on a Way Forward is released in English to the Council of Bishops. The bishops vote by an overwhelming majority to support The One Church Plan at General Conference 2019 but also agree to present the Traditionalist Plan and the Connectional Conference Plan plans outlined in the report. Here is the link to the English Version of the final report. In preparation for the 2019 Special Session of the General Conference, the Council of Bishops asked the Judicial Council if the three plans contained in the report of the Commission on a Way Forward are constitutional. In a unanimous decision, the Judicial Council found the One Church Plan to be most in compliance with the Constitution of The United Methodist Church and the Traditional Plan to have significant constitutional problems. The Judicial Council said that they did not have jurisdiction over the Connectional Conference Plan. The work is now in the hands of the delegates as they prepare for the limited three-day General Conference.